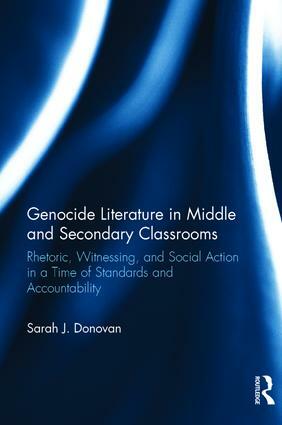 Sarah Donovan’s 2016 book, Genocide Literature in Middle and Secondary Classrooms: Rhetoric, Witnessing, and Social Action in a Time of Standards and Accountability, is a timely look at her personal journey as a middle school English teacher as she develops curricular units and pedagogy to comply with the expanded 2005 Illinois mandate to teach about 20th and 21st century genocides, in addition to the Holocaust (already mandated in 1987). In her work, Donovan pushes back on the standards-based education of the No Child Left Behind Act (NCLB) and Every Student Succeeds Act (ESSA), challenging middle school English teachers to help students explore not just the rhetoric of texts (often seen as the “right” reading of texts in preparation for standardized testing), but the rhetoricality of texts, or to “move away from identifying rhetorical moves and towards noticing texts as enacting a condition of the human experience” (Chapter 3). Teachers, and English teachers specifically, have a responsibility to help a student understand “what words can do” and how to “understand herself as a subject with agency and responsibility” (Chapter 3). Donovan’s work asks what better way there is to do this than through a study of genocides, especially using literature, such as memoirs or novels? Allaying all doubts that 12 and 13-year-olds are too young for such weighty topics, Donovan describes and encourages classrooms to “nurture and support an ethical practice of witnessing” (Chapter 4). Drawing generously from her experience as a teacher and teacher-researcher, and including additional teacher testimonies, the work provides a balance of rationale, strategy, and suggestions for content, as well as examples and reflection. Especially useful for educators, including in my own practice as a middle and high school teacher and teacher-educator, is the diversity of examples and invaluable resource lists covering adolescent-appropriate literature about the genocides in Armenia, Cambodia, Guatemala, Ukraine, Bosnia, Rwanda, Sudan, Iraq, as well as the genocide of the Indigenous peoples of the Americas. Precious few resources exist on teaching about genocides, especially beyond the Holocaust, for middle school students. Donovan has found, as have I in my own practice, that students are, “not only curious about the violence in the world but have a deep desire to understand how crimes against humanity are possible in our modern world” (Chapter 13). Hers is a poignant reminder that the objectives for, and the civic and moral lessons derived from, a study of genocides, although they often defy measurability, are of vital importance for the individual and society.